Last time we briefly looked over resources for learning TLA+ and PlusCal, as well as wrote a basic spec to prove equivalence of a few logic formulas. In this post I thought it would be interesting to write a spec for a more common scenario. This is inspired by the issue we had with MailPoet 2. An attacker was able to successfully continuously sign up users, the users would get sent a subscription confirmation email with each subscription, that way some email addresses were effectively bombed with emails. Let’s try to model and explore this situation. In the actual system we have the client, server, emails being sent out, network connections… Lots of details, most of them we can probably ignore safely and still model the system sufficiently. Let’s start with the initial situation: we want to allow TLC to send arbitrary “Messages” (actual content, metadata is irrelevant here) over time, and we want to put some limit on how many messages can be sent out over some period of time. For a start we’ll model just a single sender, storing messages in a set as a log, noting their contents and time when they were sent. Contents would be irrelevant, but in this case it helps humans interpret the situation. We’ll allow TLC to keep sending an arbitrary number of messages one by one, and then increment the time. That way we allow our model to “send 60 messages in one second”. The individual log in MessageLog is a record with 2 keys: Time and Message, and the MessageLog itself is a set. The FrequencyInvariant invariant checks that during every second of our simulation the number of messages sent does not exceed our Limit. Since we did not perform any throttling and instead allowed TLC to “send” an arbitrary number of messages - TLC sent 4 messages before the invariant failed. As the next step let’s make use of the Window constant and alter SendMessage() macro to accept messages only if doing so does not exceed our Limit. 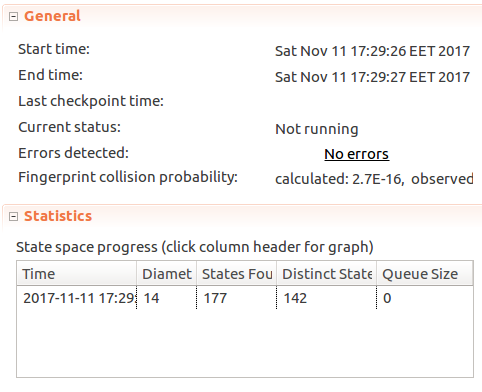 And hmm… After 10-20 minutes of checking TLC does not finish, the number of distinct states keeps going up. I even tried reducing our constants to Window <- 2, MaxTime <- 3, Limit <- 3. As TLC started climbing over 2GB of memory used I cancelled the process. Now what? Assuming that the process could never terminate, what could cause that? We tried to limit our “simulation” to MaxTime <- 3, time keeps moving on, number of messages “sent” is capped by Limit. 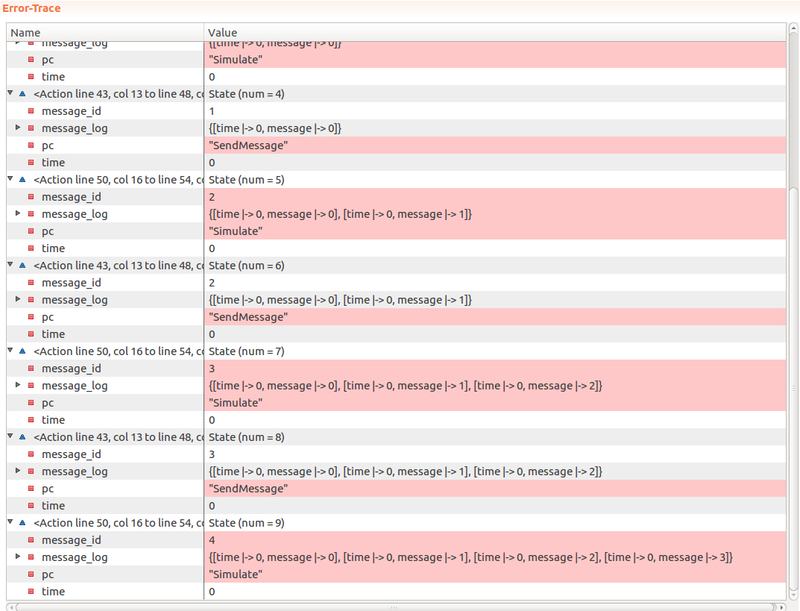 But looking back at the SendMessage label, ThrottledSendMessage() gets called and it’s result isn’t considered. But regardless of whether or not a message has been sent, MessageId always keeps going up, and each such new state could mean TLC needs to keep going. So that’s the hypothesis. We can see that TLC has found no errors, TLC found 142 distinct states and the number of messages sent at any single Time value hasn’t exceeded Limit <- 3. Great! At this point running TLC with smaller model sizes helped build confidence in the model. But will it hold if we crank up constants to say… Window <- 5, MaxTime <- 30, Limit <- 10? Unfortunately in an hour of running the model the number of distinct states and queue size just kept going up at a consistent pace, so after it consumed over 1gb of memory it had to be terminated. For the sake of the example that’s probably sufficient. I don’t see any point in checking larger models in this case, but on a faster computer, or on a distributed set of servers it could be checked much faster. Yes - TLC does work in a distributed mode, which could be an interesting feature to play around in itself.